The products may be contaminated with Salmonella. 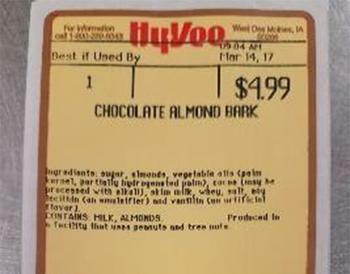 Hy-Vee of West Des Moines, Iowa, is recalling several candy trays whose contents may be contaminated with Salmonella. No illnesses have been reported in connection with these products. The candy trays were distributed to all of Hy-Vee’s 242 grocery stores across its eight-state region of Iowa, Illinois, Missouri, Kansas, Nebraska, South Dakota, Minnesota and Wisconsin. The product is packaged in a plastic container with a clear lid and a sell-by date range between January 26, 2017, and February 23, 2017, that can be found at the top of the product label. Customers who purchased the recalled products should dispose of them or return them to their local Hy-Vee store for a full refund.